Many of us who are writing PowerShell code are using Appveyor (especially for personal projects). And most of us use this to run Pester tests. Automated testing is great, it allows to set a certain standard of code quality without slowing down code delivery. But, this is just checking that the code behaves as we intended to. What about code consistency, style, readability and following best practices ? This is where a static code analysis tool like PSScriptAnalyzer comes in. This the content of my appveyor.yml file, which is the file from which Appveyor gets the build configuration. This indicates from which VM template the build agent will be deployed. As its name indicates, this allows to have a build agent running in a VM with PowerShell version 5. 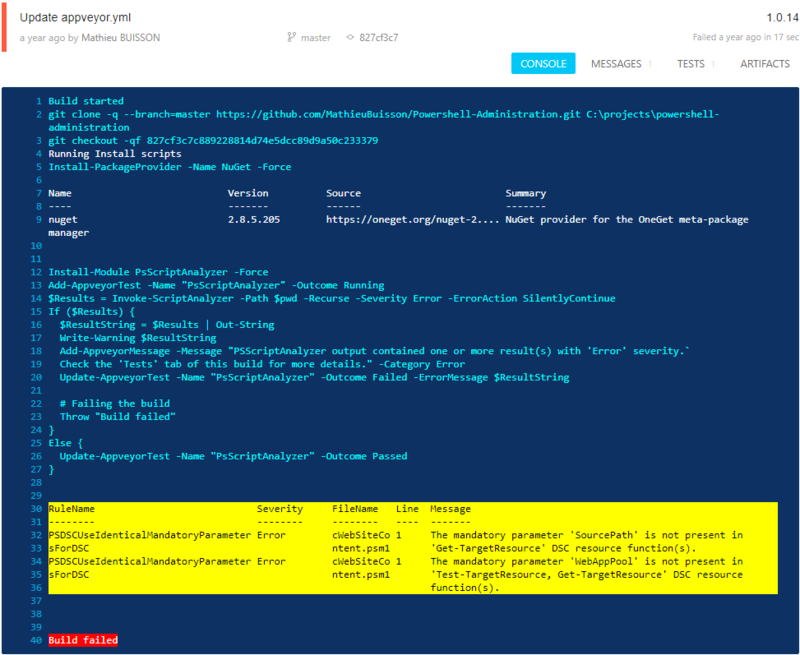 PowerShell 5 means we can easily add PowerShell scripts, modules and DSC resources to our build agent from the PowerShell Gallery using the PackageManagement module. This is exactly what we do here. But first, because the PowerShell Gallery relies on NuGet, we need to install the NuGet provider. Then, we can install any PowerShell module we want from the PowerShell Gallery, PsScriptAnalyzer in this case. We didn’t specify the repository because the PowerShell Gallery is the default one. This refers specifically to MSBuild and we don’t need or want MSBuild for a PowerShell project. This is where all the PSScriptAnalyzer stuff goes. So from an Appveyor point of view, this will be a test. Even though static code analysis is not testing, it kinda makes sense : we are assessing the code against a set of rules which represent a certain standard and we want a Pass or a Fail depending on whether the code meets the standard or not. In YAML, the pipe character | allows values to span multiple lines. This is very convenient for code blocks, like here. That way, we don’t need to add “- ps:” at the beginning of each line. Appveyor doesn’t have a direct integration with PSScriptAnalyzer like it has for some testing frameworks (NUnit, MSTest) but it’s OK. The Appveyor worker provides a REST API and even a few PowerShell cmdlets leveraging this API. One of these cmdlets is Add-AppveyorTest. Using this cmdlet, we are adding a new test, giving it a name and telling the build agent that the test is in the “Running” state. We run PSScriptAnalyzer against all the files in the current directory, recursively. We specify the Error severity, because we don’t want a violation of severity Information or even Warning to make the test fail. We store the result in a variable for later use. If there are any “errors” from PSScriptAnalyzer perspective, we want to display them as a message in the build console and in the error message of the “test”. That’s why we need to convert the output object(s) from PSScriptAnalyzer to a string. Writing the violation(s) to the build console. We could use Write-Host or Write-Output as well but as we’ll see in a later screenshot, the warning stream makes it stand out more visibly. This Appveyor-specific cmdlet adds a message to the build’s Messages tab. Specifying Error for the category just displays the message with a touch of red. Update-AppveyorTest is another cmdlet leveraging the Appveyor build worker API. Here, we are using it to update the status of our existing test and add an error message to it. We need to use Throw to explicitly fail the build. Otherwise, the build is considered as succeeded, even if our “test” fails. If PSScriptAnalyzer didn’t output anything, meaning if there were no finding of the Error severity in any file, we considered that our project passes the test. Again, we use Update-AppveyorTest but this time, we tell it that the outcome is a Pass. Do you like watching Fail videos on Youtube ? Wow, the yellow background of the warning stream is not elegant but it sure stands out ! PSScriptAnalyzer is an important tool that any PowerShell scripter should use. Appveyor is awesome, so combining both of these tools is pretty powerful. Thanks for the detailed blog post. I’ll try this in one of my Windows projects soon.